The Pact is the provocative true-life story of three friends from a rough Newark, New Jersey neighborhood. Rameck Hunt, Sampson Davis, and George Jenkins made a pact in high school to find a way to go to college and then medical school. The three doctors not only accomplished this, but they are now spreading the word to inspire other inner-city kids to stay off the streets and take the educational route to a better life. The Pact captures the pathos of the doctors’ individual journeys, the integrity of their voices and the power of their rare friendship with each other. Their stories affirm the values that ultimately sustained and drove them: courage, tenacity and faith. This remarkable film pays tribute to the life of the mind and its power to turn dreams into reality. To see The Pact check out Spark Media On Demand. Release Date: Spring 2008 APTV on public television stations nationwide. 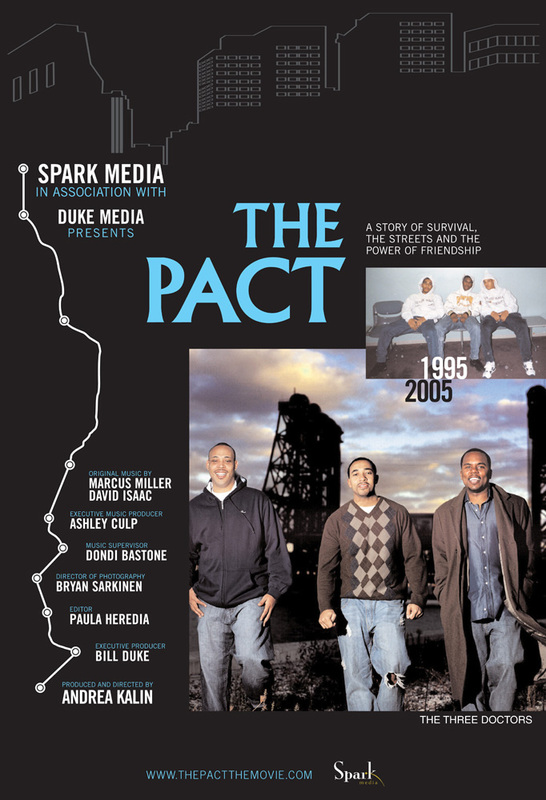 “The Pact” is the centerpiece in a national, youth-focused community engagement campaign that is using the documentary to support health education, youth development and community empowerment. “The Pact” is used in classrooms across the country to inspire children and show them that there is no limit to their dreams. The film still screens at community events and festivals across the country. Several festivals, such as the Cleveland International Film Festival, made “The Pact” part of its youth activity programming and have invited area schools to bring their classes to the film. Pharmaceutical company GlaxoSmithKline uses an abridged version of the film for its Healthy Communities initiative, and includes a film viewing during their health screening and community event programming. Since the importance of mentoring is stressed by The Three Doctors and by the film, Spark Media has developed relationships with numerous mentoring organizations, including Future Black Men, African American Male Leadership Institute, and the Maryland Mentoring Partnership.